sassyfrazz: Bring the family together for GAME NIGHT with Hasbro!! Bring the family together for GAME NIGHT with Hasbro!! Hasbro has some really great new games that just came out, and they are sure to get your kids excitement up! Toy Story 3 just came out this summer, and Hasbro has a few new games with the Toy Story 3 theme. Yatzee Jr. Disney Pixar Toy Story Edition is a hit at our house. Yatzee Jr. is very similar to the original Yatzee, but instead of dots (1-6) on the sides of the dice, there are character pictures. With three rolls, the player tries to get 5 of Buzz, Ham, Mr. Potato Head, Bullseye, and Rex. The more you get of that character, the more you have in points. Woody is on the dice, as well, and he is a wild player....meaning he can be used as a wild in the set the player is trying to roll for. The players have to watch out for Lotso, though...he may change your score~ and not for good, either! I think this is a great game for preschoolers and early elementary children, because they are counting, recognizing colors, matching, and building their strategy skills. It is great for kids to play this game together, too, because they work on their team building. My kids have a lot of fun with this game, and I think it is very suitable for their ages (age 3 & 5). My kids love Toy Story, too, so it is an instant hit! Foam, circular disks are inserted into the top barrel on the shooter, turn on the shooter, and aim. Jesse, Rex, Mr. Potato Head, and Mrs. Potato Head are in jail cells, and Buzz needs to blast them out of there with his space shooter. Sunnyside daycare has good toys in it, and some not-so-good toys lurking about, and Buzz needs to protect them all and rescue them. So, each player shakes the dice to see what they get to do. Certain rolls allows the player to take a shot at a jail cell to free one of the toys, or they can remove a "bad player" off the game board...or put one back on. My kids enjoy this game, and it is easy to understand the rules. I know they love aiming the shooter to blast the pawns off the game board. I think this game is great for hand eye coordination, and also provides great strategy skills. Our family loves the game of Monopoly, too...and as we all know, that game can be a long, very long game. Well, Hasbro has designed a Monopoly game that you can have a little control on the length of the game. 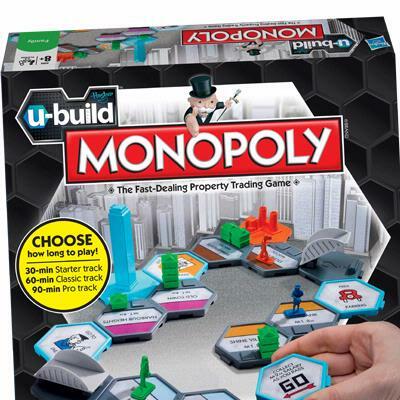 It is called, U-Build Monopoly, and it brings more options to the player. Players can customize the game board to make the game go quick, or play longer. The game pieces are hexagonal property spaces that link together with a snap. 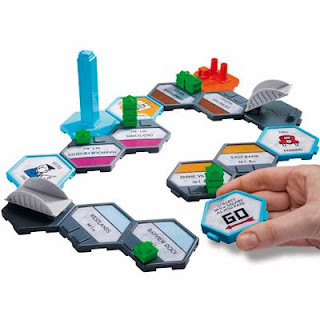 During the game, players build stadiums, hazards, skyscrapers and more to help make the game harder for their opponents. The Starter Track is an option to play the 30 minute game, and the other option is the Classic Track which is an hour game. There is two other options: Pro track (game lasts 90 minutes), for the ultimate challenge, or the Freestyle where you can make your board game creative by mixing up the tiles or shape of your track. The amount for purchase and rent have changed from the classic monopoly, as well. The U-build Monopoly works with bigger money amounts, like 1.4 Million, and 600k. These games are found online and in major retail stores. I was sent these three games from Hasbro in exchange for a honest review. I am not compensated for my time or written review. The opinions in this post are of my own and do not reflect on the company. Moon Dough~ a fun activity! Hasbro helps get you geared up for school!